Home > 2019 and Beyond > The Story Behind the Picture: 20 Big Rules for Economic Development in the Era of Acceleration! You know you are doing something right when an organization brings you back for the 3rd time! The International Asset Management Council is an organization relentlessly focused on economic trends, and represent two distinct groups – economic development representatives from government organizations, including states, provinces and cities, as well as individuals in many Fortune 1000 organizations responsible for future site locations for manufacturing plants, R&D facilities or other corporate locations. The content of my talk? Look at this picture. Now read this post. IAMC had me in for a keynote in 2003 to put into perspective how the Internet and technology would continue to change the global economy, and again in 2010 to paint a picture as to why we would continue to see massive economic growth after the economic downturn of 2008. My predictions in both keynotes were bang on. Fast forward to 2017: they just had me in to open their fall 2017 economic outlook conference in Richmond, Virginia, with a keynote focused on the trends that are providing for future opportunity in the manufacturing sector. 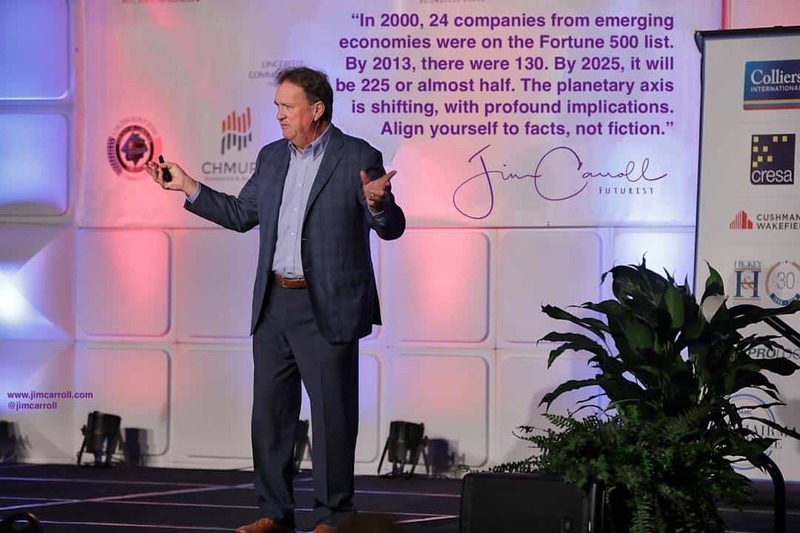 That was easy for me to do – I’ve done dozens of keynotes in the world of manufacturing sector over the last decade, both for manufacturing associations as well as Fortune 500 companies. 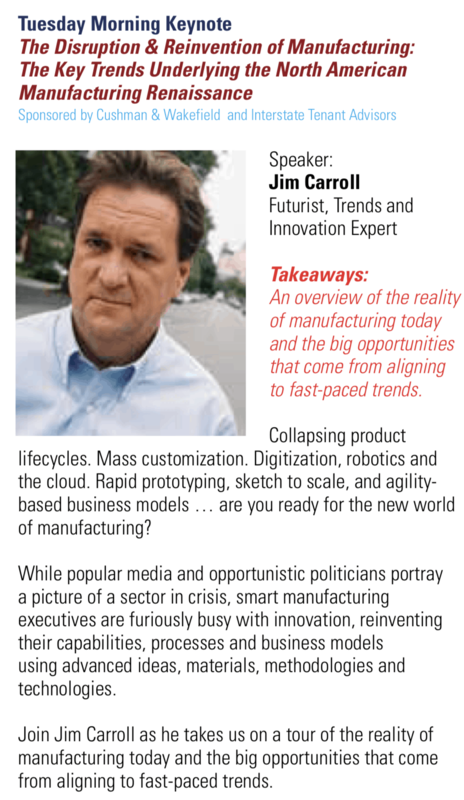 The undercurrent of my talk, though, in putting manufacturing trends into perspective, was the broader theme : we live in a transformational period of time, in which people and organizations are making big bold decisions related to major trends, in order to discover and establish success in the next economic wave. Obviously, folks like Elon Must. So what should someone in economic development do to discover the next wave of economic opportunity? Here’s a good list to start thinking about the question! Align to tectonic shifts – While there is only one Tesla Motors and Gigafactory, and but one Elon Musk, there are many other new companies and people reinventing our world. There are a massive number of new disruptive trends (such as detailed in my blog post, Disruption: There’s More to It Than You Think There Is! Each of these trends which can provide for big economic opportunity, massive industry shift, and the establishment of new companies. Watch those disruptive trends, and understand where future growth with occur. Be relentlessly positive.The trends defining the future are around us now, and are defining future economic growth! Over my 25 years as a futurist, I’ve been through several economic downturns, but have always preached that real opportunities are found in trends: science, technology, knowledge and transformation. When the next inevitable downturn hits (we’ve been on a great 8 year run since 2008), make sure you keep your thinking aligned to future opportunities. Think trends, not fads. It’s all too easy for those in economic development areas to focus on the fad of the day: think, for example, of the hysteria around the recent Amazon 2HQ beauty contest. While you probably need to chase opportunities like this, don’t let it make you forget out about other trends that are charging the future forward. Challenge assumptions on speed. The future is happening faster than you think! Consider, for example, how quickly self driving cars are coming about, and the rush to electric vehicles. Both have profound economic development implications, such as what I suggest in this post, Self-driving Cars and Economic Success. Challenge yourself on velocity: be prepared to accelerate your efforts. Align to fast science. All trends are based, at their heart, on the result of scientific discovery. Think about the fast pace of evolution of battery technology, and how Nevada hit a home run with the placement of the Gigafactory in Reno. Here’s the thing: batteries are the new plastic, and there is going to be a lot of economic growth, investment and new industry established around this one single aspect of our world of science. Focus on ‘smart’. There’s a lot of hype about smart cities and the future, and some of it might be overplayed. But clearly, organizations in the future will choose to place facilities in locations that have smart infrastructure, smart highways, fast bandwidth, and all the other attributes of being at the forefront of trends. Don’t be dumb. I can’t think of a dumber economic initiative than the money that Wisconsin is putting behind the Foxconn plant. Expect to wake up in 5 years to headlines as to how idiotic the structure of the deal was. Don’t jump on board fake trends. Don’t be afraid to fail. Having said that, be prepared to make some mistakes along the way. Nevada put a lot of money into an initiative by Faraday involving an electric car factory that appears to have failed. Is that a bad thing? Not necessarily so, since when it comes to aligning to the future — you win some, and you lose some. Be like Fiji. Fiji doesn’t have a potato industry, but no matter. They’ll build one. For a great economic development attitude, read this post. Think skills. Focus on the new job categories that are emerging. For example, in the world of agriculture, we are seeing the emergence of all kinds of new careers, such as vertical farming infrastructure managers, drone helicopter insurance crop risk managers, robotic herd health monitors and cattle ranch drone herder infrastructure managers! Go into any industry, and watch the new careers coming about – and then think about the economic development implications that might come from that. Go global for ideas. Think big trends. Vertical farming mentioned above? Already there are 800 million ‘city-farmers’ according to UN statistics – including 25% of population of Burkina Faso, 35% in Cameroon, 63% in Kenya, 68% in Tanzania. Fast fact: 90% of the fresh vegetables in Accra, Ghana come from farming within the city. So vertical farming is a major trend, and has implications for your local economy. Assess what it might mean in terms of opportunity, infrastructure, new companies…. Get distributed. Make sure your infrastructure is aligned to the new decentralization. Consider local renewable energy generation, or “distributed energy resources.” It’s growing 3-5x faster than centralized energy — one California utility estimates investments in DER in solar and micro-grid is now growing faster than its own main new-energy & basic grid investment. Distribution is happening in every industry, resulting in fascinating new companies establishing wonderful new companies based on concepts that didn’t exist just a few years ago. Watch for clues. We live in the era of the ‘grand challenge” — initiative such as the XPrize Foundation, which challenge the global scientific community to solve some of the biggest problems of our time having to do with energy, healthcare, the environment, transpiration. The XPrize led to SpaceX; the Darpa challenge led to the emergence of the self-driving car trend. Other challenges are leading to the birth of other new billion dollar industries. Ignore those who are playing defence. Doomed business models fight losing battles to try to protect their future, and most often, fail. That’s happening right with automotive dealer associations as they try to protect a dying business model in the face of rapidly changing consumer behaviour, and upstarts like Tesla who dare to do something different with automotive stores in shopping malls. The same holds true for record companies in their battle against Mp3 music — we now live in a music streaming world. Place your bets on the disruptors, not the disrupted. Align to the bold changes. For example, take a look at how Saudi oil giant Aramco is realigning its business to petrochemicals and away from oil. That parallels other big shifts — from carbon cars to electric vehicles; from coal to renewables; from car-buying to car-sharing. Better to align yourself to those who are making big bold moves as opposed to those who are stuck in the status quo. Look for exponential trends. WE sequenced 1/10000th fo the human genome in 1990, and 2/10000 in 1991. It was only 1% by 2007 – but 7 years later, it was done. That’s exponential math: 1% is only 7 doublings away from 100%. The same type of trend is driving solar : we are at 2% solar today, but 2% is only 6-doublings away from 100%. We’re doubling solar capacity every 2 years, and so that leaves only 12 years to 100%. Understand exponential industries, and you’ll understand economic growth. Be like the Jetsons, not the Flintstones. Coal isn’t the future. Get over it. Think long term. Just like investing. Creativity doesn’t care about economic downturns. Those who invent the future will keep doing so despite any economic uncertainty. Have a long term economic success plan, and stick with it through the ups and downs. Think global. Look at the picture below which I put up on day as part of my daily motivational posting. Simply put. America isn’t everything. 21. Hire me! Seriously. If you want to discover the future of economic opportunity, bring in a futurist like me. We’ll share with you what comes next, infuse you with our optimism, and show you a path forward.